iMacsoft DVD to MP4 Suite for Mac is professional Mac DVD to MP4 Converter and Mac MP4 Converter suite designed just for Mac OS X (including Mac OS X 10.10 Yosemite, Mac Intel and Mac PowerPC) users to rip and convert your favorite DVD movies and video files to Mobile Phone video and audio formats with ease. iMacsoft DVD to MP4 Suite for Mac is bundled by two professional products: iMacsoft DVD to MP4 Converter for Mac and iMacsoft MP4 Converter for Mac. iMacsoft DVD to MP4 Converter for Mac is a powerful Mac DVD to MP4 converter, which can convert DVD to MP4, AVI, M4A, MPEG4, DivX, XviD, MP3, AAC to play on iPod classic, iPod touch, iPod touch 4, iPod nano, iPod nano 5G, iPhone 3, iPhone 4, iPhone 5, iPhone 5S/5C, iPhone 6/6 Plus, iPad, iPad 2, the new iPad, iPad mini, iPad 4, PSP, Creative Zen, Zune, Zune 2, iRiver PMP, Archos AV500, Archos AV700, Archos GMini402, iRiver PMP-100, PS3, Xbox, etc. iMacsoft MP4 Converter for Mac can convert all popular video formats to MP4 video, such as converting AVI to MP4, MPEG to MP4, WMV to MP4 and supports almost all popular video files including AVI, MPEG, WMV, MOV, 3GP, QT, ASF, RM, RMVB, MKV, FLV, SWF, ASF to MP4, MPEG-4, H.264/MPEG-4 AVC, AVI, XviD, etc. 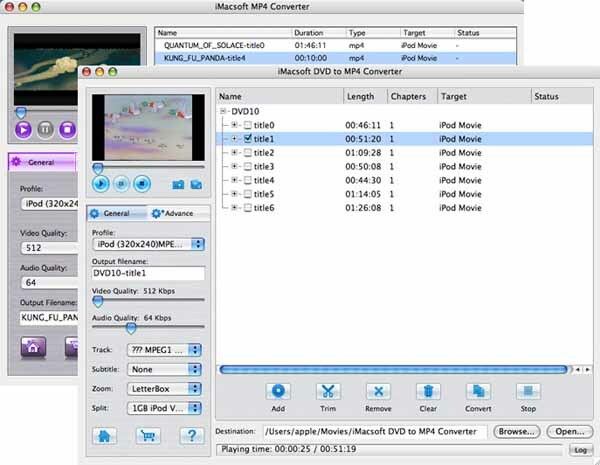 iMacsoft MP4 Converter for Mac can also convert audio to MP3, AAC, M4A with excellent quality. iMacsoft DVD to MP4 Suite for Mac is so easy to use and faster than ever before, just a few clicks are enough. Free download iMacsoft DVD to MP4 Suite for Mac and have a try now! Including General Settings and Advanced Settings for professional users. These settings include audio bit rate, frame rate, duration, quality, audio codec, etc. iMacsoft MP4 Converter for Mac is a professional Mac MP4 Video converter, which can convert various video formats to MP4 (MPEG4) video. It can convert AVI to MP4, MPEG to MP4, WMV to MP4 and supports almost all popular video files including AVI, MPEG, DivX, MOV, RM, WMV, 3GP, VOB, H.264/MPEG-4 AVC, VCD, DV, etc. It also can convert audio to MP3, AAC, M4A with excellent quality.